It’s our goal to keep your teeth healthy for a lifetime. Sometimes, emergencies happen. Discomfort isn’t simply inconvenient—delaying getting the attention you need can also cause damage to your oral health. While coming into the office as soon as possible is vital if you have one of the following dental emergency, there are some things you can do at home until you can see us. A knocked-out tooth: When picking up the tooth, don’t touch the root; pick it up by the crown. Try to keep the tooth moist. Attempt to place the tooth back in the socket. If you are unable to do so, wedge it between your cheek and gums, or in milk. To increase your chances of saving the tooth be sure to see your dentist within 30 minutes of the injury. A broken tooth: Rinse your mouth thoroughly with warm water to clean the area. Apply gauze to any areas of your mouth that are bleeding. Then apply a cold compress on your face to minimize swelling. Until you can get into the office, you can take an over-the-counter pain reliever. A toothache: Rinse your mouth a few times daily with warm salt water to diminish pain and swelling. Applying a cold compress to the outside of the cheek area that’s closest to the affected tooth can bring relief. Over-the-counter pain relievers also can reduce pain until you can see your dentist. No matter what the cause of your dental emergency may be, it’s essential that you seek help immediately to ensure that more serious treatment isn’t necessary. If you’re unsure whether you’re experiencing a dental emergency, we recommend that you contact us as quickly as possible. 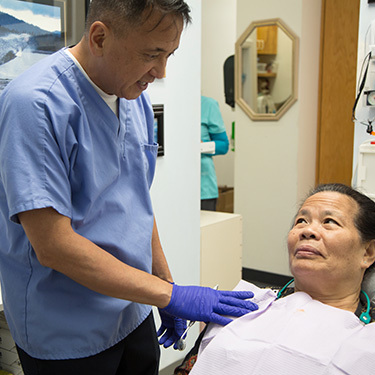 Our Kapaa and Pearl City locations offer 24-hour emergency care.